What are the adjustment values for the Massflow model? By means of the adjustment values 1 and 2, the original measurement curve (raw values) is associated with an actual leakage. This is necessary because a "volume factor" is created by the overflow method and the overflow buffer between buffer volume and total volume. This is also noticeable at the pressure ratio of the buffer pressure to the test pressure. The calibration is essential for correct working. For this purpose, a leakage calibrator is required as measuring means. First, determine the pressure ratio between the buffer pressure and the overflow pressure after the overflow. With this ratio, the correct buffer pressure for the desired test pressure must then be entered into the parameters. How does it come to "pseudo" - leaks? During the filling process, thermo-dynamic processes occur in the test gas (test air), which are to be compensated at a later time by the environment. If shorter filling times are used, the test gas (test air) on the two sides of the differential pressure sensor (test volume and comparison volume) can not compensate and a curved differential pressure characteristic is produced during the resting or measuring phase. Depending on the parameters, the curve can be either upwards (direction positive values) or downwards (direction negative values). By means of a corresponding filling pressure adjustment in the filling phase 1, this effect can be counteracted somewhat. There are actual leaks e.g. In the testing device. In this case, however, you should first remove the leakage before setting a master value, since otherwise incorrect measurements can occur. There is a temperature influence. Cooling the test gas (test air) results in negative and heating to positive values. In this case as well, it is necessary to determine exactly where this temperature influence originates. In the case of constant operations, the setting of a master value can be used to counteract this effect. However, an incorrect application also leads to incorrect measurements here! 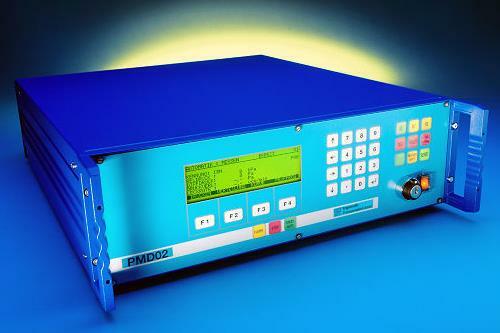 What is the parameter "volume" for the PMD02? The PMD02 in the variant DIFFERENTIAL PRESSURE can detect and evaluate leakage not only as pressure change per time (e.g., as Pa / s) but also as volume flow per time (e.g., ccm / min). For this conversion to be possible correctly, the PMD02 requires the value of the total test volume connected to the test side. This consists of a test piece, hose and internal device volume. This total value must be entered in the corresponding parameter of the test program. For more information on the calculation of the volume flow from a pressure drop, please click here! A simple protocol is possible via the serial interface RS232 "Serial 2". The device can be set in such a way that a result telegram is sent here after each measurement. The telegrams can be recorded with a simple printer or a terminal program. In addition, it is possible to record and evaluate the data as curves and / or data records with the APT software PMD02-ANALYZE. Is there a guide for creating a test program?